In another example of how Wall Street wins at America's expense – again – Big Banks around the world are secretly rooting for another U.S. Federal Reserve interest rate hike this week. That's because every Federal Reserve interest rate hike causes an immediate spike in their income. The Big Banks already are raking in millions every year courtesy of the Fed – interest paid on the billions in reserves they have parked at the central bank. Even if the Federal Reserve Open Market Committee doesn't raise rates at its Tuesday-Wednesday FOMC meeting, most market observers expect at least one or two rate hikes before the end of the year. That means billions more in payouts to Big Banks. Last year the U.S. Federal Reserve paid out $6.9 billion to the Big Banks, including more than $100 million to Goldman Sachs Group Inc. (NYSE: GS) and more than $900 million to JPMorgan Chase & Co. (NYSE: JPM). Even more appalling is that nearly half of that $6.9 billion was paid to foreign banks operating in the United States. That would include Deutsche Bank AG (NYSE: DB), UBS Group AG (NYSE ADR: UBS), and Mizuho Financial Group Inc. (NYSE ADR: MFG). "Please, please explain," Rep. Maxine Waters (D-CA) begged of Fed Chairwoman Janet Yellen at a House Financial Services Committee hearing last month. Until then, the Fed didn't pay interest on the reserves Big Banks held there. But 2008 is when the Fed embarked on its radical monetary easing policies to combat the financial crisis. Those policies included lowering interest rates to near zero while buying up bonds and mortgage-backed securities in a series of "quantitative easing" programs. Paying interest on the reserves also created a new tool for the FOMC to manage the federal funds rate. This was necessary because the QE bond-buying made it difficult for the FOMC to control interest rates by managing the reserves. "Rather than varying the supply of reserves, the Fed now manages the federal funds rate by changing the rate of interest it pays on reserves," wrote former Fed Chairman Ben Bernanke in a February blog post. 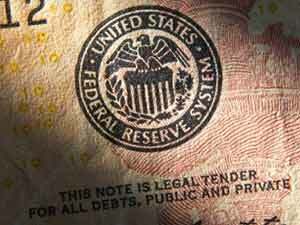 The rate on reserves was initially set at 0.25%. But last year the FOMC decided the time had come to reverse its near-zero interest rate policy. 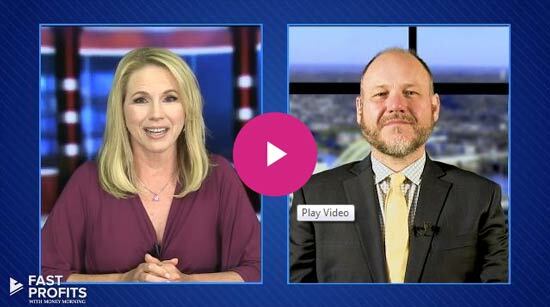 We saw the first Federal Reserve interest rate hike since 2006 in December. 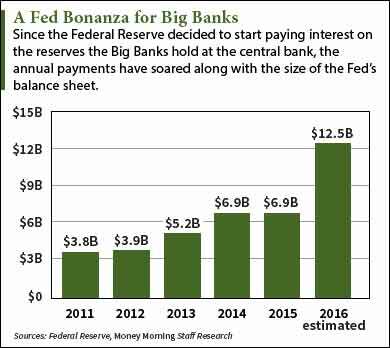 The interest payments to the banks had been rising along with the Fed's balance sheet — each successive QE program added hundreds of billions of reserves. That stopped last year because QE ended in 2014. But now the payments will get pushed higher for another reason – rising interest rates. The Fed interest rate hike in December forced the central bank to raise the rate it pays the banks to 0.5% — necessary because that's how the Fed manages interest rates now. But it also means that a steep hike in the amount the Fed will shell out to the Big Banks this year – somewhere in the neighborhood of $12.5 billion. Of course, that assumes no more Federal Reserve interest rate hikes in 2016. But the FOMC has already signaled that it's in a period of tightening. Most observers expect at least two rate increases this year, one in June and one in December. With reserves standing at $2.5 trillion, a rate of 0.75% means the Big Banks collectively would get an $18.77 billion payout from the Fed. A second Federal Reserve interest rate hike in 2016 ups the largess to about $25 billion. If the Fed ever gets to point of "normalizing" interest rates at 3%, the Fed will be forking over a whopping $75 billion in annual payments to the world's Big Banks – many of which played a leading role in causing the 2008 financial crisis that made the Fed's easing policies necessary. The only way for the Fed to avoid these outrageous payments to the Big Banks is to lower the excess reserves by selling off all those bonds on its balance sheet. But that's easier said than done. Selling off hundreds of billions worth of bonds would roil the markets. As Yellen told the House committee in February, shrinking the Fed's balance sheet now "would be very disruptive to the economy." So the Fed is stuck. Meanwhile, the Big Banks will keep getting this absurd form of government welfare for years to come – with every Federal Reserve interest rate hike pumping the payout higher. The Bottom Line: The Federal Reserve interest rate hike from December did more than shake up the stock market last year. It doubled the annual interest payments the Big Banks receive from the Fed. With more rate hikes expected as the Fed tightens, the windfall to the Big Banks will grow into tens of billions of dollars. Unfortunately, the Fed's huge balance sheet has tied its hands. The way it looks now, the Big Banks will keep getting these massive payments from the Fed for years to come.